That’s one of the things we missed most about Portland – it’s somewhat of a breakfast and brunch mecca. Come taste, and you will see. One of the first things we did when we got back was go to Bijou Cafe – our favorite breakfast spot. It was there that I discovered the tofu scramble that t0pped all other tofu scrambles – a masala-spiced, veggie-loaded, savory scramble that haunted me for days after we left. Fear not, I was immediately on the case and am thrilled to report that I have NAILED this thing down to the very spices. Let’s get to brunching! The star of this recipe is the tandoori masala spice blend. If you’re not a spicy-food person, fear not! This is a complex spice blend that isn’t spicy in a hot way, just flavorful. I did a little research about masala spice blends and it can get a little complicated so I picked one up at Whole Foods to see if it came close. Secret time? I’m convinced it’s what the folks at Bijou use. But, if you don’t have access to the Tandoor Masala spice blend at Whole Foods, I’ve included a blend below that should get you pretty darn close. 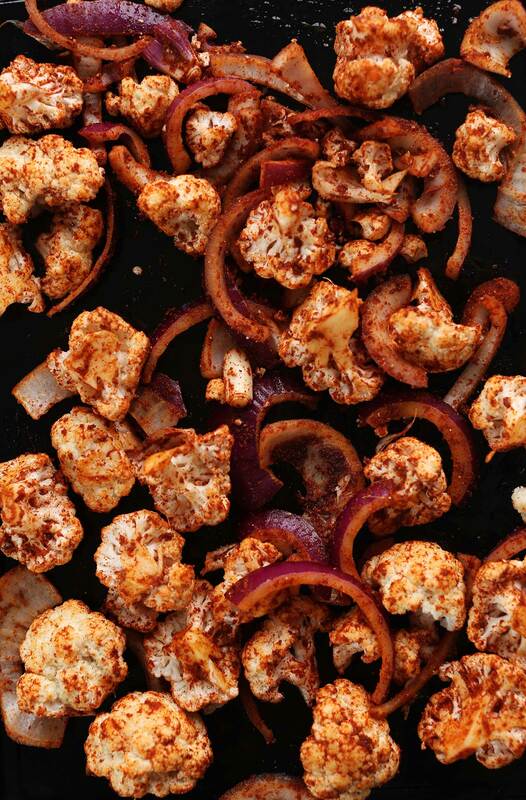 One of the things I love most about this scramble is the exceptional use of cauliflower. Let’s be real, nobody likes cauliflower. But in this scramble, it’s my favorite part! 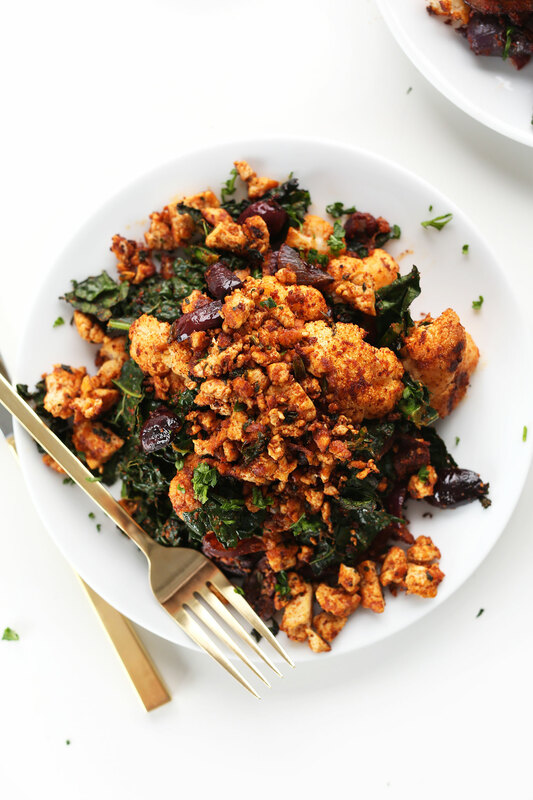 It adds so much heartiness and texture and blends perfectly with the red onions and kale. 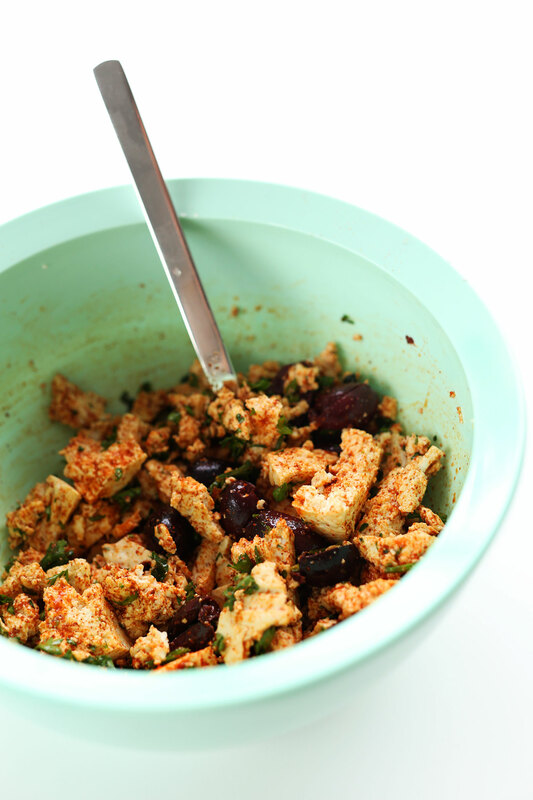 Kalamata olives add a salty touch that brings the whole thing together. My favorite part – it’s simple! 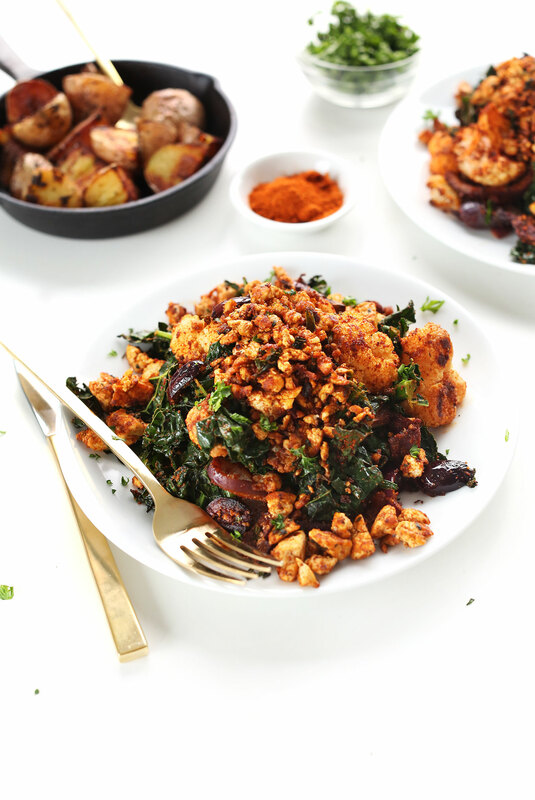 If you can roast veggies and shake on spices, you can make this dish! Here’s the thing, I think I’ve made this recipe so close to the original at the restaurant that I like mine a little more! I know, it’s serious. Plus, I get to eat it with my Best Damn Vegan Breakfast Potatoes that cannot be trumped. If you make this recipe, let us know! Leave a comment, share it on social media, or our favorite – take a picture and tag it #minimalistbaker on Instagram so we can see! We love seeing what you guys cook up. 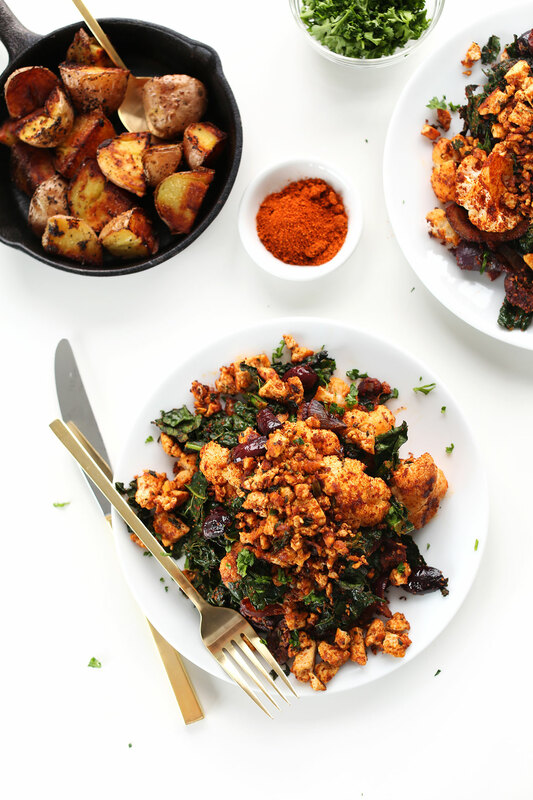 A masala-spiced tofu scramble with roasted cauliflower, onion, and kale that takes just 30 minutes from start to finish. Healthy, satisfying, delicious, and perfect for any time of day! Preheat oven to 400 degrees F (204 C) and wrap tofu in a clean, absorbent towel and set something heavy on top (like a cast iron skillet or tea pot) to begin drying. Add chopped onion and cauliflower to a large mixing bowl with 2 Tbsp oil, 3 Tbsp masala spice blend and a healthy pinch each salt and pepper (amounts as original recipe is written // adjust if altering batch size) and toss to combine. You want it very heavily seasoned - almost all visibly coated (see photo) - so add more spice if necessary. Add to a lightly greased or foil lined baking sheet and bake for 20 minutes. 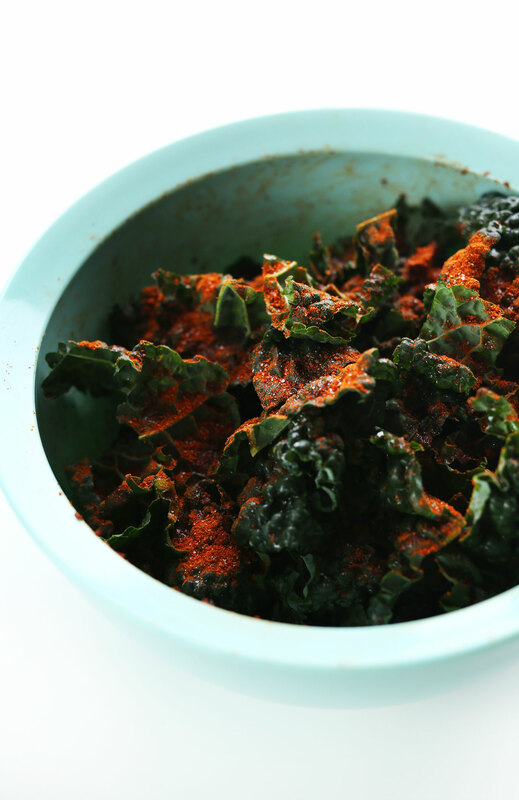 In the meantime, add kale to the mixing bowl you used before and toss with another dash of oil and a shake of masala spice, salt, and pepper. Massage to coat. At the 20 minute mark, stir cauliflower and onion to cook evenly and add the kale to one end of the baking sheet. Bake for 5 minutes more. Move onto the tofu while veggies are baking: Preheat large skillet to medium, medium-high heat. While heating, to the same mixing bowl you used before, add the tofu and use a fork to piece it apart. Add chopped olives, 1 Tbsp oil and another healthy shake (~ 1 heaping Tbsp) masala blend (amounts as original recipe is written // adjust if altering batch size), salt, and pepper. Optional: I also added a dash of hot sauce for color. If using parsley, add half at this time for color and reserve the rest for garnish/serving. Once the pan is hot, add a bit more oil and then the tofu mixture. Continue cooking and stirring (adding more masala if desired) for about 5 minutes, or until it looks visibly browned and dry. 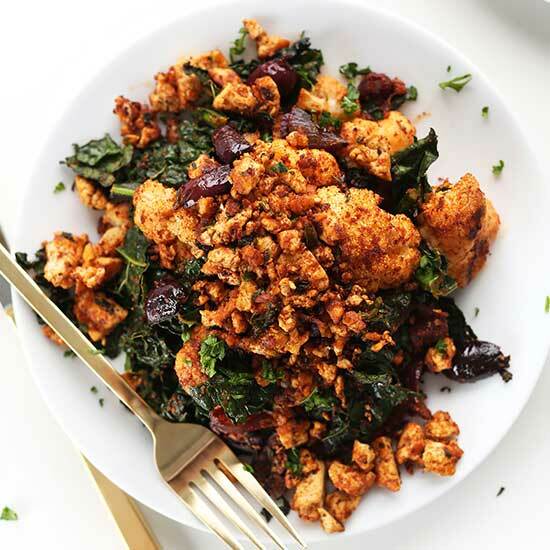 To serve, place the cauliflower/kale/onion mixture on the serving plates and top with tofu scramble. Garnish with a bit more fresh parsley and serve with hot sauce and breakfast potatoes, if desired. Although, I think it’s perfect on its own. Store leftovers in the fridge, covered for up to 2 days, though best when fresh. 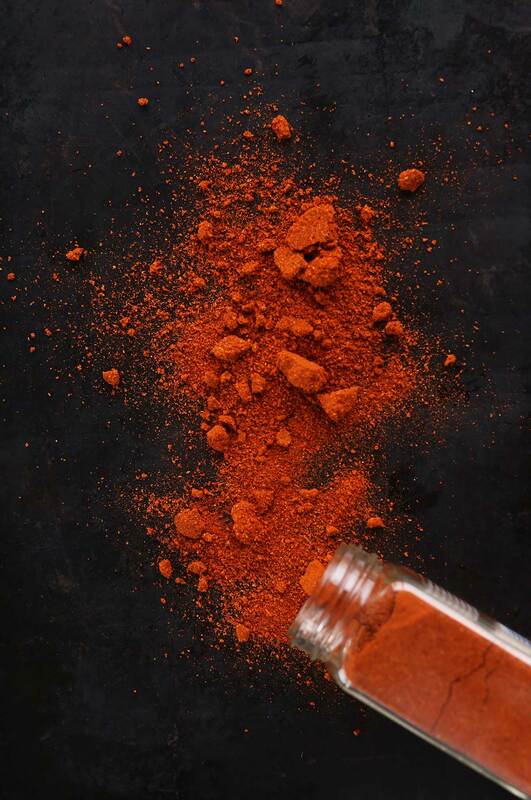 *DIY Tandoori Masala Blend: 3 Tbsp cumin, 2 Tbsp garlic powder, 2 Tbsp paprika, 3 tsp ginger, 2 tsp coriander, 2 tsp cardamom. Multiply as needed. *I bought my Tandoori Masala blend at Whole Foods and it was spot on and delicious! *Nutrition information is a rough estimate calculated with the lesser amount of oil. I made it this morning, I had to adjust a few things because I had run out of some spices but it was delicious. I searched it on some hash brown and with some cashew/salsa/chilli sauce on top. Delicious! and my kids and husband loved it too. Made this today, I had all the spices recommended to make the spice mix myself so I did that instead of getting a specific mix, I prefer to be able to add each spice individually. The dish itself was good, I made the potatoes as a side and mixed it all together at the end. I would have added more spice mix to the tofu but the dish overall was tasty and the potatoes go great with the dish. The only less than positive comment I have is that this took me over an hour to make from start to finish with cutting all the ingredients, mixing and cooking. I don’t think I am a particularly slow cook but who knows. I had to let my veggie mix bake for 40 min, maybe the electric oven? I had it set to the temp in the recipe. I don’t mind the extra time so much to cook but I just thought 30 min seemed a bit inaccurate. Help! Going to make this for dinner tonight ? not a huge olive fan.. what can I substitute in lieu of olives? I love cauliflower too and have done so all my life. I will even happily eat steamed cauliflower tossed with just lemon juice, salt and fresh ground pepper. Which makes me super excited to come across this recipe! I love cauliflower (I really do). Does that make me a nobody? I live cauliflower too!!! One of my favorite vegetables! This is really good! I added salsa and it made it a lot better I think! This dish was super delicious! I went to Whole Foods and got the Tandoori spice mix- and was glad I did! The breakfast potatoes on the side were a great addition as well. Next time I will add a few more olives because I really liked the briny factor they contributed. I needed to use a head of cauliflower I had forgotten about, and found I had the other ingredients on hand already to be able to make this easy and delicious breakfast (okay, at 2pm) on New Year’s Day. 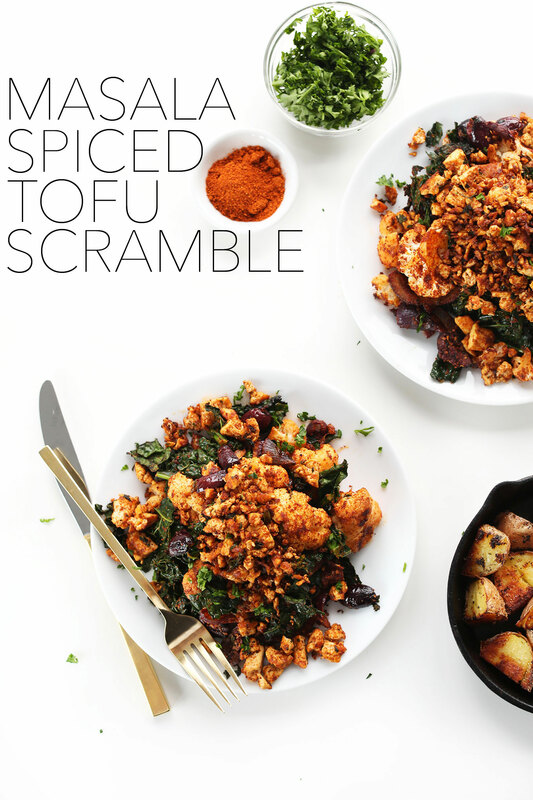 I usually make variations on the same old tofu scramble, so my fiance was pleasantly surprised and thought this dish was incredibly delicious! I added a zucchini to the roasted veggies since I wanted to use that up as well, and sliced an avocado on top. Will definitely be making again! This recipe has been on my wish list for awhile. I finally had a chance to make it last night. YUM!! Definitely adding it to the repeat list. I think I’m late to the party, but I just found this site, and just made this recipe. Delicious! I actually doubled the cauliflower and onions, because I wanted to use them up. Cut down the oil a bit (trying to lose baby weight). It was really great. Can’t wait to try some more recipes. The sweet potato Buddha bowl is on deck! This was my first tofu scramble and I loved the unique masala seasoning blend! I had some leftover masala spice so there will be more tofu scrambles in the future. I ended up using white onions since that’s what I had on hand and they were great. When roasted together (I doubled the roasting time), the onions became really sweet and was a nice balance to the rest of the spices and flavors going on. I also used curly kale instead of lacinato and green olives instead of kalamata olives for convenience. Thanks for another great recipe Dana! I discovered your blog while doing a vegan challenge but continue to come back over omnivorous recipes since these are so easy, tasty, and healthy! This one is no exception. Just made this for the first time. EXCELLENT! I have to admit, I was a tad skeptical about the olives. I guess I think of them as more a part of a Mediterranean flavor profile rather than Indian, but they ended up being my favourite part! Thank you for sharing! I accidentally read ‘cinnamon’ for ‘cardamom’ in my spice cupboard. I didn’t realize it was cinnamon until it was in. It still tastes amazing but I’m looking forward to making it right next time! Soooo delicious! I made the spice mix myself because I had the components in my pantry already, and used green olives (also had on hand). It turned out amazing. Glad I doubled the recipe! I’m excited to eat the leftovers for breakfast. This recipe is really good but to be honest, kind of dry with just the spice for seasoning. I will definitely make it again but on the search for a dressing or sauce to add in along with the masala. I also substituted in tempeh because I can’t stand tofu and it worked out really well. Thanks for taking the time to comment, Tara! So glad you enjoyed it! Ooh, would definitely love to try this! Kale isn’t as accessible where I’m from. What can I substitute for it? Any other sturdy dark green! Made this for dinner yesterday and it.was.sooo.good! Wonderful! thanks for sharing, Sophia! Hello, I was wondering if I could use Garam Masala instead of Tandoori Masala? Can I sub with curry powder, or is it the tandoori masala that’s the key to this recipe? So excited to try it out! It really does taste amazing in this recipe. Otherwise, sub broccoli or a similar cruciferous veg! Looks delish! Can’t wait to try! Does the calorie count include the potatoes?? Thanks! Nobody likes cauliflower? I do! In our family we make delicious vegan cream of cauliflower soup, cauliflower gratin with cashew sauce, and even cauliflower patties! They are all good. AMAZING!! So simple, so delicious. I rec’d the recipe in my email, went to the store right from work, came home, made it & then we destroyed it!! We made those bomb breakfast potatoes as well. I used coconut oil & I also added baby bellas to the masala dish. You guys seriously rock. So happy I found you! Working on a combo of the crispy eggplant (part of the eggplant parm recipe) & the pizza w/ the herbed Trader Joe’s crust. Stay tuned! Yay! Thanks for sharing, Jen!!! Has anybody really tried it? It looks and sounds delicious but all the replies are from folks that have not made the dish. I notice this in a lot of blogs and it doesn’t really help those of us that want real feedback. I do love your site. Would like more fat free vegan recipe. Made it. With the potato recipe as well. Made both recipes exactly as stated. It was absolutely delicious. I’m actually allergic tofu/soy. Do you think a good substitute would be eggs or meat? I can’t tell from the recipe. Thanks! This looks great. Can’t wait to try it! I would totally brunch with this!!! I have been allllll about tofu scrambles lately. I’m also one of the few (only?) people who actually likes cauliflower. This is calling my name HARD. Oooohhhh. This sounds incredible. I may have to take a break from my green smoothie kick and cook this up for breakfasts next week! I just made a tofu scramble for dinner last night, because I love breakfast for dinner. You version looks incredible! Definitely keeping this one in mind for my next scramble! Oh oh! I must try this sometime soon! My husband is Indian and we’re vegetarian so this is just spot on! Somehow I haven’t thought of spicing up tofu, other than buying the marinated one. Thank you! This looks scrumptious, and good for you to boot. Yummy! We are total brunch people too. I’d die of happiness if this was served to me. I love the tandoori masala spice you used! So glad I live in portland because now I have to go to Bijou Cafe! I don’t know if I have ever tried marsala before–I will have to pick up a bottle and give it a go! And I too, am totally a brunch person. I just don’t get how anyone couldn’t be!